The melting season in Greenland peaked in late July, according to the latest report from the National Snow and Ice Data Center. When it is all over, NSIDC scientists project that the season will be much closer to the long-term average than last year — when more of the island’s ice sheet melted than during any other year in the satellite record. The image above, acquired by NASA’s Terra satellite, shows the surface of the ice sheet in western Greenland pockmarked by blue melt ponds, as well as what appear to be a lacy network of meltwater channels. The ponds are not unusual, as this part of the coast typically does experience melting in the summer. A good deal of the ice here also seems to show a grayish discoloration. Melting reduces the albedo, or reflectivity, of snow and ice, so the darker tone may be the result of that. But I’m wondering whether dust blowing in from far afield was a contributor. By darkening snow and ice, it can contribute to melting. I’m tracking this down and will post an update when I get an answer. 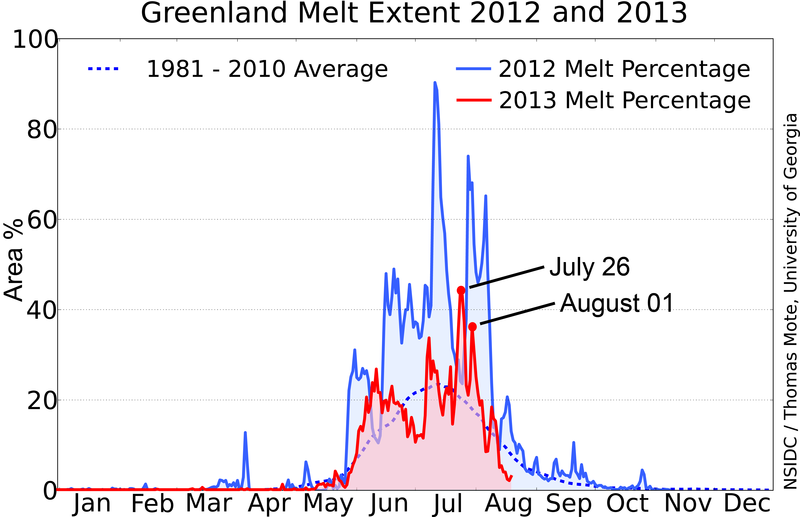 The period between July 21 and August 19 [click here for a graphic] included the greatest percentage of surface melt extent days for Greenland during 2013, peaking at 44% on July 26 [click here]. However, the overall melt extent for 2012 was far greater, exceeding 40% for several weeks [click on thumbnail at right]. 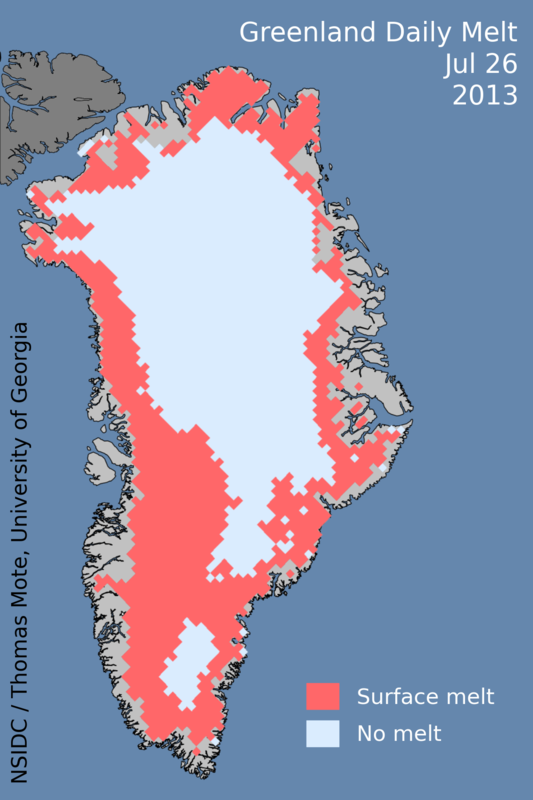 Although melting was much less extensive this year than last, the town of Maniitsoq did experience what may have been the highest air temperature recorded in Greenland since 1958: 78.6 degrees F on July 30. According to the NSIDC report, strong winds from the south brought unusually warm temperatures to the region. That was compounded by air rushing down from higher elevations. This compresses and thereby warms the air. The image at the top of this post shows an area not far from Maniitsoq just a day or so after that high temperature was recorded. Despite that unusual event, “the majority of the ice sheet showed mild to moderately lower-than-average melt duration for this season,” according to the NSIDC report. There were many more cars on the road this year, more worldwide air traffic, more trucks on the road and more people on the planet. So is global warming man made or not. Do we still call it global warming or are we sticking with climate change? Don’t be intentionally obtuse. I am a skeptic, but we all know that any anthropogenic effects on climate will manifest in the average over many years, not year to year. This year’s below average melt is no more proof against global warming than last year’s record was proof for global warming. I almost hate to see these articles because they aren’t comprehensive and get cherry picked as convenient. Thank you for these good points. I appreciate it. Concerning the fact that this piece is not comprehensive: As much as I’d like to, I can’t possibly write a feature article every day. 😉 So I report news as I come by it, and over time do the reporting for longer, more comprehensive pieces. I might add that even when I’ve done nuanced, comprehensive stories, they’ve been cherry picked. Usually people believe what they want to believe. As humans, we appear wired to see things through a biasing scrim. oh, of course. I didn’t mean it in any way as a criticism of your writing or the style in which it was presented. I understand you can’t and shouldn’t write a 20 page article every two weeks when there is a bit of relevant climate data news. I just think its a shame that people take an informative article and try to use it as a conclusive article. I’m sure that someone will link this post in a void to “prove” that global melting isn’t on the rise. The irony is that its not only an inaccurate use of the article, but it also undermines the position they are trying to support by making it look farcical. I truly miss the days when we could discuss issues without them devolving into extremist ideology. Kudos for making sure to mention both the low melt this year and last year’s record in one go. 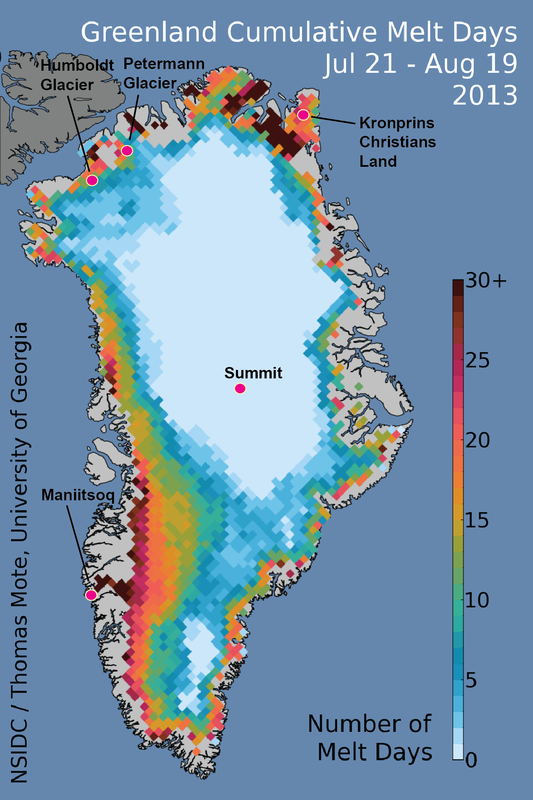 On a related note, one thing I would be very interested to see is a chart of estimated melt extent (i assume they have ways to estimate based on soil samples) in Greenland since the end of the pleistocene… preferably with local maxima emphasized. I’m excited to see what you turn up. Jim is pretty good about responding to questions like this, so I’ll report back what I find out. We have a handful of ice cores from north to south in Greenland, all of which record melt layers. So theoretically, we could look at melt extent year by year in a coarse geographic sense. However, if the time of the melt is in the distant past (more than a 200 years or so) the dating can be iffy enough that synchronizing melt layers to the year can be tough. And as the spatial coverage is thin, unless its a doozy, its hard to say that melt seen in one core is spatially representative. Bottom line: Getting a scientific answer to your question is very difficult! Keep in mind that surface melt during a relatively brief span of geological history is one question. Another is how the Greenland ice sheet as a whole has behaved over long periods of time as carbon dioxide and temperature have gone up and down in the past. That’s bread and butter for paleoclimatologists like White. And their findings do give us ample cause for concern about our emissions of greenhouse gases. I suspected anything they had on that would be pretty speculative. I mean, now that you have had one high melt season, you no longer have the primary resource to determine how old that ice was… the ice itself. I suppose with enough samples you could determine the last time you had more extensive melt. And like his answer implied, its not like the melt pattern is the same every year. Nature is rarely that convenient. It really is a shame there isn’t a handy way to privatize basic research funding outside of the areas that have potential to be directly monetized. We have so much red on our federal ledger, it seems likely that reliable funding will be hard to come by for some time. In a way your making my point. The sad fact is global warming believers tried to railroad through that man it the leading cause for global warming without allowing debate or discussion. Politicians tried to tax the weather without debate. Can you only imagine and endless supply of money that they could tap into every time we have record floods, record heat, record cold, record anything without even having an honest debate. We should be looking furiously into new sources of clean renewable energy. We should be attempting to find cleaner ways to process fossil fuels and looki at ways to improve nuclear energy. After all the energy of the entire universe is nuclear so it must be something we should attempt to refine and understand better. Every thinking man woman and child on the planet should get behind clean renewable energy but in typical fashion politicians tried to tax a cause which deeply divided people. Our political leaders found a way to divide people on an issue that everyone would have gladly gotten behind! Climate change = the changes that occur as a result of global warming — the kinds of things we DO experience more or less directly. For example, increased frequency and intensity of heat waves and droughts. These terms do not have to be political. They have specific scientific meaning. Climate changes. All the time. Always has. Always will. Scientists give meaning to words based on their own biased political agendas to. Your question indicates your knowledge is confined to denial sources. The terms are not mutually exclusive. Tom has explained the meanings. References to “climate change” go back to the earliest published reports. 1956 I think. This topic should never have been one that divides people. A clean environment is something that everyone can get behind but liberal politicians saw an opportunity to raise funds through cap and trade tax which politicized the issue. On top of that they attempted to say here is the evidence, accept it as fact , never allowing serious debate or even discussion. Taxing people on changes in the weather is tantamount to taxing people for eating food or putting on your shoes (oh sorry we already pay tax for that). Also the liberal idea/scam for carbon credits was simply paying for a clean conscious. The church did this a thousand years ago and it did not work back then. Global warming/climate change/cap and trade have done incalculable damage to the environment by making the issue political. It will take generations to recover from this arrogant attitude. Everyone suffers when this happens. Global warming climate change is one thing. How you deal with it and dodgy politiciansis a seperate issue. He makes a valid point that the discussion has been so politicized as to make it impossible to trust that you have found a reasonably unbiased source. You almost have to assume it is biased and see if you can still wrangle conclusions out of what you take for granted as flawed methodology. Go with peer reviewed evidence and sound science. That’s the thing though. Scientists have biases too. The politics of it become relevant to the science because of where funding is coming from and what ideology (yes, scientists are prone to political ideology like the rest of us) the community at large has adopted. You can probably assume that a group of climatologists working for british petroleum isn’t the best source of climate information. But is a study funded by the Sierra Club any more reliable? How about government funded studies when the funding is being allocated by politicians that subscribe to extreme ideology? You aren’t sure if the study is biased, so you rely on peer reviews to tell you. How can you be sure the review isn’t biased? It can be difficult to suss through and it is truthfully easier to rely on less controversial issues. Air pollution has very well defined effects on human health. Acid deposition is destroying statues and buildings, nevermind what it does to delicate aquatic ecosystems and cloud forests. Truthfully the measures we take to solve one issue are largely the same measures we take to solve the other. The economic factors is why the degree of urgency is so important and why the alarmist/denial debate is so heavily politicized. Science us like the market. Provided there are no monopolies, anyone can prove otherwise. I was just reading about Milankovitch theory. Its pretty fascinating. Just from a historical context, there have been so many regional climate shifts since the start of the Neolithic period that had a massive impact on how agriculture and civilization developed. Small shifts in precipitation can mean everything. It really is something to contemplate… with our global community and technological resources, are we better equipped to deal with any potential shift in climate (natural or otherwise) or are we too far into the outer range of sustainability to have the flexibility to adapt? I mean, we’ve not even learned to manage the aquifers we do have. Just food for thought. I’m not sure I even really have a point beyond how interesting the subject is even outside of the political and scientific debate. Thank you for this excellent perspective! I have read ancient people had worked out the smallest Malinkovich cycle. 26000 years is it? They spotted it by plotting shifts in winter equinox at sunrise in places like Stonehenge where light through an aperture can be marked on a heel stone. Eventually a curve is noticed and extrapolation does the rest. Or so the story goes. Theoretically possible I gather. The climate science calculations take those into account.